You don't have to know Polaris from the Pleiades, or Albireo from Zubeneschamali to align this big 10"LX90-SC Schmidt-Cassegrain with UHTC multicoated optics on the skies for an evening of observing. Its standard equipment includes a GPS (Global Positioning Satellite) receiver and an AudioStar computer that takes the guesswork out of finding your way around the skies. 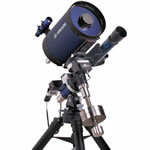 It will let you locate dozens of deep space objects like a seasoned observer your first night out. 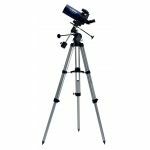 If you have the dark skies to take full advantage of its considerable light gathering (57% more than an 8"telescope), this scope can keep you happily observing and photographing for the rest of your life. With advanced UHTC multicoated optics, it is also 15% brighter than a 10" scope with conventional optical coatings, making deep space observing a joy. 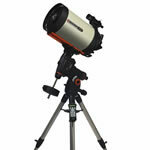 And it's portable enough to make taking it to a dark sky site a reasonable proposition. 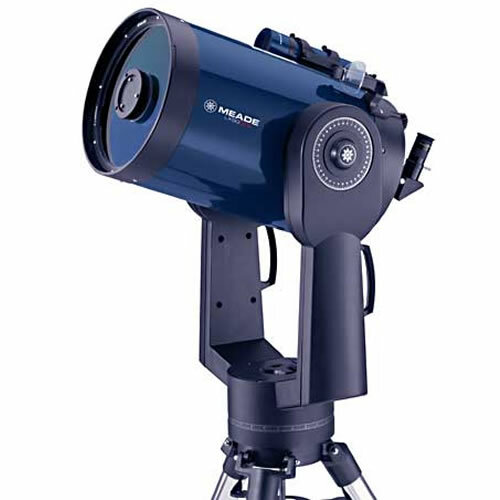 With 57% more light gathering capacity than an 8" telescope, this scope's 10" Schmidt-Cassegrain optics give the Universe a visual and photographic sharpness and grandeur at dark sky sites that no smaller telescope can approach - no matter how good that smaller scope might be. With a photographic limiting magnitude of 18, all of these sights can be photographed in detail. 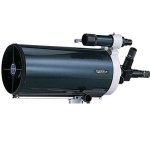 This big 10" scope will perform well on faint deep space objects such as galaxies and nebulae under mildly light-polluted suburban skies, if provided with the proper light pollution filter. However, it is at a remote site with truly dark and steady skies that you'll best be able to take full advantage of its large aperture, and superb optical performance. This is not a scope that's happy staying in a light-polluted city or suburban observing environment. 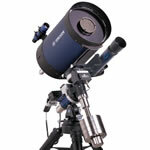 But, if you have regular access to dark skies, and the size and weight of the scope (a 50 lb. 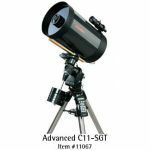 optical tube to lift up onto the tripod) doesn't daunt you, the 10" LX90-SC with UHTC multicoated Schmidt-Cassegrain optics may be the perfect scope for you, particularly if you're a deep space enthusiast. The simple tripod/altazimuth mount configuration of the 10" LX90-SC with UHTC optics makes setup fast and easy. The automatic alignment features of the GPS receiver and AudioStar computer and its simplified menus will start you observing in only a matter of minutes. The wide array of objects in the LX90-SC database, and the 5 arc minute pointing accuracy of the AudioStar computer, will accurately speed you from object to object with no frustrating hunting or star hopping. With the LX90-SC, you'll spend more of your time looking at objects and less time looking for them. With the 15% additional light transmission of its UHTC optics you'll spend less time photographing them, as well. Schmidt-Cassegrain optics: 10" aperture (2540mm focal length f/10). Fully-multicoated UHTC (Ultra High Transmission Coatings) multicoated optics with oversized primary mirror for the highest possible off-axis image brightness. Aluminum tube construction with glare-stop baffling. Guaranteed diffraction-limited performance. For more details, click on the "optics" icon above. Finderscope: 8 x 50mm straight-through achromatic design, with a 5deg.field of view and 12mm eye relief. It focuses by loosening the trim ring behind the objective lens cell, screwing the lens cell in or out to focus, and tightening the trim ring to lock in the correct focus. Eyepiece: 1.25" Series 4000 26mm Super Plossl (96x). The eyepiece field of view is 0.52 degree, a little wider than the full Moon, for expansive lunar and deep space views that fill the eyepiece. Fork mount/drive system: Die-cast aluminum drive base. Light-weight, but rigid, die-cast aluminum dual fork arms with a carrying handle on each fork arm. The mount includes servo-controlled 12V DC slewing and tracking motors in both altitude and azimuth. The motors are powered by eight user-supplied C-cell batteries that fit into the drive base. An optional #RCXAC adapter is available to power the scope from 110-120 volt 60 Hz AC household current in your back yard to conserve battery life. High capacity rechargeable 12 VDC battery packs are also available. 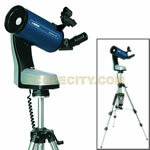 Adjustable height tripod: The tripod (the same one used on Meade's premium 10" LX200 telescopes) adjusts in height from 30" to 44". It has 2" diameter steel legs that damp vibrations quickly, with a center leg brace that locks the legs firmly in place for added rigidity. Three 1.25" diameter holes in the leg brace can hold eyepieces while observing. A single threaded rod with a large hand-tighten knob simultaneously holds the scope firmly on the tripod and locks the legs rigidly in the most stable position. 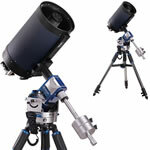 Audiostar computer: The LX90-SC's Audiostar computer hand control plugs into the telescope's fork arm to permit a wide array of telescope options. First and foremost is its automatic go-to capability. The Audiostar computer can show you the planets and thousands of deep space objects the very first night you use your scope - even if you've never used a telescope before! At the push of a button, the LX90-SC will move at a fast 6.5deg.per second to any of the more than 30,000 deep sky and solar system objects in its database, then track it flawlessly across the sky while you observe at your leisure. There are standard solar, lunar, and sidereal tracking rates with 2000 precision-selected incremental rates that permit observatory-level precision in tracking the Moon and planets. 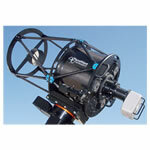 The AudioStar includes a dual-axis drive corrector for long-exposure guided astrophotography. AutoStar Suite Software: This software package integrates the LX90-SC with your PC or laptop computer for an enhanced range of performance features. It includes a planetarium program with a database of 19,000,000 stars and deep space objects to display on your computer screen. Connect the scope to your computer using the supplied cable, click on any object in the sky map on your computer screen, and your LX90-SC automatically slews to that object. 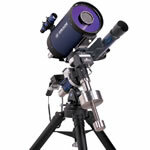 You can use it to control your telescope remotely via the Internet. "Talking Telescope" software (included) converts AudioStar text displays to synthesized speech through your computer speaker. And you can use all of the program's planetarium features for planning future observing sessions when nights are cloudy by automatically generating AudioStar Tours of favorite objects with a simple point and click.